Villanova became the most recent defending NCAA men’s basketball champion to fail in its bid to go back-to-back, the tournament’s No. 1 overall seed bowing out in the second round Saturday with a 65-62 loss to 8-seed Wisconsin. The Wildcats’ early exit is the latest for a reigning champ hoping to double down, as each of the past 10 national title winners has failed to advance past the Sweet 16, including four who didn’t qualify for the next Dance. 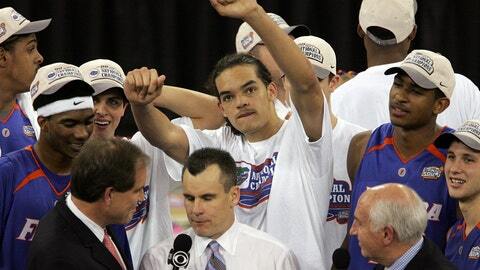 But a decade ago this month, before they wound up NIT-bound in 2008, Florida did something only one other team has done since the UCLA dynasty of the 1960s and ‘70s: The Gators actually repeated as champs. This is the story of how they did it. MCT via Getty Images/This content is subject to copyright. 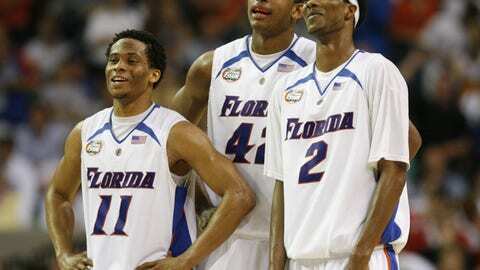 Over the course of the 2006 and 2007 NCAA tournaments, Florida went 12-0, outscoring its dozen opponents by an average of 15 points per game, with only four wins coming by single digits, and one of those — a 57-53 victory over Georgetown in the 2006 Sweet 16 — coming by fewer than seven points. 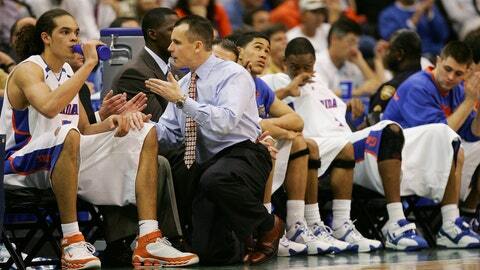 However, for practical purposes, the Gators’ two-year run of dominance began on the recruiting trail in 2003 and 2004, when head coach Billy Donovan assembled the program’s most impressive freshman class to date, bringing Al Horford, Joakim Noah, Corey Brewer and Taurean Green into the mix for the ‘04 season. At the time, Florida was less than a full four-year class removed from the school’s best season, having finished runner-up to Michigan State in 2000 in the program’s second Final Four appearance (the first came in 1994). And though the team had failed to capitalize on that momentum in subsequent years, with opening-weekend losses to inferior opponents in each of the next three tournaments, the expectation was that the new crop might be able to put the program back in the spotlight. “As a player, you think every team you’re on has the potential to do something special, but that’s hardly ever the reality,” former Gators forward Chris Richard said. “But when they came in I definitely saw something different in them that I knew we needed. 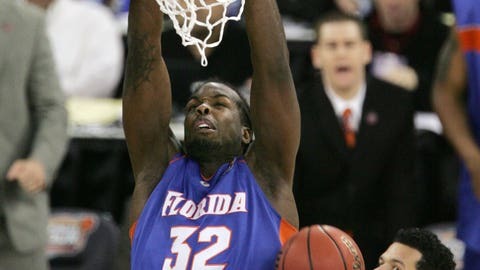 The early returns left plenty to be desired, though, as Florida’s super-freshmen failed to make the impact some anticipated during the 2004-05 season. 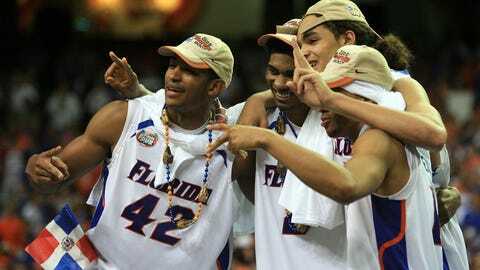 The Gators, at that time, were still David Lee, Anthony Roberson and Matt Walsh’s team, and though Florida did win the SEC tournament and entered the NCAA tournament as a 4-seed, it was dealt yet another second-round exit in 2005, this time at the hands of 5-seed Villanova. The following season, Florida’s fate was almost solely in the hands of its now-sophomore stars, who were flanked by Richard, fellow junior Lee Humphrey and incoming freshman Walter Hodge, and after a 17-0 start that included wins over top-20 teams in Wake Forest and Syracuse, the young Gators found themselves ranked No. 2 in the nation. Their standing was later called into question, however, during a 5-6 run in conference play that drew the attention — and criticism — of some past Florida stars. A second consecutive SEC tournament championship followed, and Florida entered the NCAA tournament as a 3-seed. After coasting to a first-round win over South Alabama, the Gators got a break in the form of Milwaukee’s win over 6-seed Oklahoma, resulting in UF’s second consecutive matchup with a double-digit seed. Fortunately, there were no surprises, and after eliminating Milwaukee and eking past Georgetown — which also did Florida a favor by knocking out 2-seed Ohio State — all that stood between Florida and the Final Four was its old foe Villanova. So, too, did the Randy Foye- and Kyle Lowry-led Wildcats, who played from behind virtually the entire game and spent most of the second half trailing by double digits in a 75-62 loss. Or, in Florida’s case, a twice-in-a-lifetime feeling. Following the win over top-seeded ‘Nova, Florida played yet another 11-seed in George Mason in the national semifinal in Indianapolis — the Gators, by their own admission, got about as friendly a draw as a team could hope for — and advanced to the championship game with a 73-58 win over the Patriots. Nor did they give much thought to the pedigree of UCLA, their opponent in the national championship game, and the result was a convincing 73-57 win. At that point, the only question was whether Florida’s stable of stars would be back to defend their title, but that, too, was an easy decision — even if it wasn’t for the reason you might think. 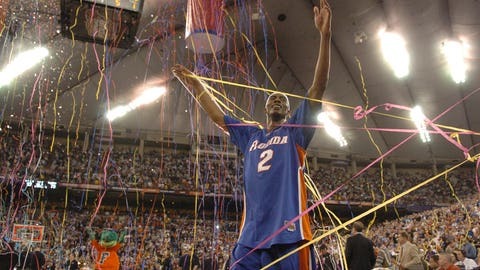 Of course, having the tools to win a second consecutive championship and actually doing it are different — as every other defending champ for the past 40 years except the 1992 Duke team can attest — and as the 2006-07 title defense kicked off, the Gators felt the distinct pressure that comes with having a target on your back. Still, there was no pressure quite like the pressure Florida put on itself. And for most of the season, they did, as the Gators ran out to a 24-2 start and never fell out of the top 10 in the polls. But then a 2-3 slide heading into the SEC tournament raised questions about whether Florida actually had the stamina to repeat. “I think in those three games we just kind of flatlined a little bit,” Green said. “The pressure and the media and all this stuff — I think it just got to us. But we did a good job refocusing for the tournament, because that was always our goal, to win a championship. Any questions about Florida’s mettle were answered, however, during a three-game sweep through the conference tournament that saw the Gators win by margins of 17, 21 and 21. And as a 1-seed, Florida felt like the tournament was theirs for the taking. Much like the 2006 tourney, Florida, again, coasted through its region, with convincing wins over Jackson State, Purdue, Butler and Oregon to set up a rematch with UCLA, this time in the national semifinal in Atlanta. Except unlike 2006, when the specter of the Bruins’ past hung over the game, this time the Gators felt they had the upper hand before the ball was even tipped. “We had absolutely no concern for UCLA at all,” Richard said. “Before we actually played, the night before, we had a banquet dinner that all of the final four teams go to, and you could say we had a mini-confrontation with UCLA. It didn’t get too far out of hand, but once we got into what we got into at that banquet, we knew that we had them. Another double-digit victory over the Bruins then set Florida up for a championship face-off against Ohio State — whom the Gators had beaten by 26 in the regular season. 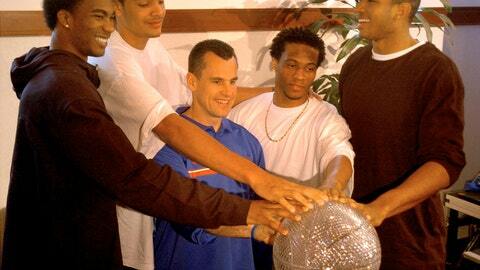 Still, Donovan made it a point to keep his guys from feeling overconfident. Sure enough, Oden pulled his weight, posting 25 points, 12 rebounds and four blocks, and Mike Conley added 20 points, six assists and four steals, but it wasn’t enough as — spoiler alert — Florida won 84-75 thanks in part to a 10-of-18 shooting night from 3. There’s a case to be made that Florida would have become just the second school to three-peat had its stars returned for their respective senior seasons, especially considering the freshman additions of Nick Calathes and Chandler Parsons and the continuing development of Marreese Speights, who was set to take over for Richard in the middle. But according to the players, that run at history was never on the table. The former Gators can appreciate how much they each benefited from staying in school as long as they did, giving themselves the chance to develop together on the floor. 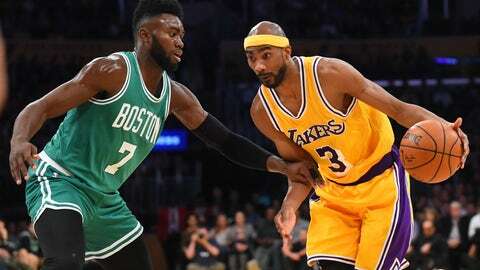 “Nowadays, everybody is putting pressure on the kids to go score a bunch of points and go right to the NBA, but for us we came to get better,” Brewer said. “And each year, each one of us got better, as basketball players and also as people. We grew as people and as friends and it helped us on the court. We never let anything get to us. One might think there’s a lesson to be learned from Florida’s unselfish approach, but ultimately, Brewer says, the lure of the NBA has been the biggest factor preventing other teams from repeating in the years since Florida became the last to accomplish the feat. It remains to be seen who will be the last team standing when the current tournament draws to a close next month, and it’ll no doubt be a long road back to the top this time next season. But eventually someone else will join the elite group of programs that have gone back-to-back, and if Florida’s own experience counts for anything, it’ll be a title that gets sweeter with age.